O2 has stopped selling the iPhone in the UK. Could this mean that we will be getting the 3G iPhone here in the UK at the same time as our friends in the US? When the iPhone was released in the US, we had to wait a few months for it to be released in the UK, with all the rumors going around the web about the launch of a 3G iPhone in the US in June I wonder if we will get it in the UK at the same time. I suspect we will be getting it here at the same time as the US as 3G is massive over here and the coverage is very good. What does this mean for existing iPhone users in the UK? When I bought my iPhone last November I had to sign up for an 18 month contract, if a new 3G iPhone is released in the UK next month I wonder if we will be able to buy the phone and add it to our existing contract. 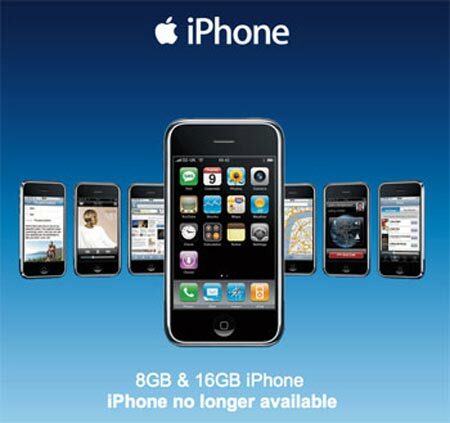 If O2 are smart they will let people add the new 3G iPhone to their existing contract, otherwise you will have a lot of iPhone users tied into an 18 month contract, I guess we will have to wait and see.